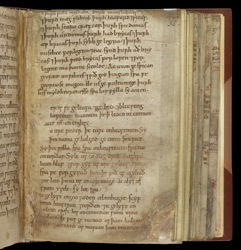 This manuscript is written by several scribes, two of whom almost certainly worked at Exeter Cathedral while Leofric was bishop (1046-72) and it was probably given to the cathedral by him. The second text on this page, in paler ink and different handwriting, is the Lord's Prayer in Old English. The prayer was known in the Middle Ages by its opening words in Latin: 'Pater noster' (Our Father). The last paragraph on the page consists of the start of the Creed.